Last week I had the pleasure of visiting Roses For Autism (http://www.rosesforautism.com/), a non-profit rose farm in Guilford, Connecticut whose overarching mission is to benefit individuals with autism. I first became interested in Roses about a year ago, and I was immediately intrigued by their emphasis on supportive employment and transitioning special needs individuals to the real world. It was a pleasant drive from New York to Connecticut on I-95 on an overcast and crisp, but not yet cold, fall afternoon. Foliage lined the highway. I arrived at the Pinchbeck rose farm at about two o'clock in the afternoon. Cows grazed on the side of the road as we pulled up to the main entrance. We were greeted warmly by Tom Pinchbeck and Michelle Ouimette. I had hoped to observe the employees in action, but they had just left for the day. Tom and Michelle showed me around the premises. On the lot, there were two greenhouses, one of which was currently in use. The one greenhouse produces around 500,000 roses per year. Lilies are grown and sold as well, but those make up a much smaller share of the business. A high-powered boiler room provides a steady flow of steam to the greenhouse to maintain an optimal temperature. The individuals with autism whom Roses employs are responsible for growing, monitoring, cutting, packaging, and shipping the roses, as well as for other aspects of the business. They are paid employees, not interns or volunteers - a distinction that Roses emphasizes to encourage ownership. Since Roses is an "inclusive" environment, most of the employees are "typically developing" people who serve as mentors to those with special needs. Students from local mainstream public and private schools volunteer at the rose farm. Profits from the sale of flowers are invested back into the business to cover employees' salaries, to fund scholarships and career training programs, and to ensure that the business can sustain itself in the future. If Roses is the business part of the organization, Discover Learn Work is the training part. Individuals with autism and related disorders can enroll in Discover Learn Work for business training that may include coursework at college campuses, internship opportunities at various training sites, coaching through the job interview process, or support through gainful employment. What I found particularly interesting is that Discover Learn Work works with local public schools to meet the needs of transitioning students who require vocational training. In New York, transition programs and vocational training are a huge unmet need. Discover Learn Work participates in IEP meetings to aid in developing transition goals, and works with IEP students to implement their transition goals at one of the Discover Learn Work training sites. Roses is part of a larger parent company called Ability Beyond (http://abilitybeyond.org/about-us/), which is run by CEO Tom Fanning (http://www.rosesforautism.com/tf/) and operates in Connecticut and New York. Roses is a growing company with plans for expansion. Short-term goals include opening the second greenhouse and creating a stronger brand image. Long-term expansion plans are still taking shape. On my way out, I purchased a few dozen short-stem roses and some lilies for the women in my family, who were enchanted by the scent and quality of the flowers. There is a phenomenon we have all experienced when we hear a new word, phrase, or concept for the first time and then start to notice it everywhere…and I’ve been experiencing that phenomenon with regard to the Reggio Emilia schools. I learned about Reggio Emilia a few weeks ago when I attended Brooklyn College’s Universal Preschool In Sweden event. I quickly learned that the Reggio Emilia model is well-known throughout the education world. A few days later, I learned about an upcoming event about infant and toddler development through the lens of Reggio Emilia, presented by Explore + Discover and My Learning Springboard. I attended the event on Thursday and truly enjoyed the evening. The event was hosted in a beautiful space in Tribeca. Arriving guests were greeted warmly with music playing in the background and snacks and drinks awaiting consumption. The crowd was intimate and diverse, with various professionals from different backgrounds in the audience. Although a power point presentation and video clip guided the presentation, the conversation was informal and interactive, with audience members sharing their perspectives and personal experiences. The presentation consisted of many of the same points as were presented at the Brooklyn College event: child-centered approach (letting the child’s interests guide instruction, rather than following a predetermined agenda set by the teacher), teacher/parent as researcher (understanding the child’s interests through observation of the child’s individual movements and patterns), and materials conducive to learning (easily accessible, natural, etc.). The overall message, to put it succinctly: encourage the child to explore and discover! A point I hadn’t considered prior to this evening was the importance of recording children’s thoughts and comments as they explore and discover, which can help to track and understand the development of a child’s interests and his/her overall personal growth. I developed an appreciation for the importance of exposing children to sensory stimuli early on. Children also need to learn the consequences of their actions through guided exploration, rather than to fear the unknown because of overprotective teachers. To conclude the evening, we explored the similarities and difference among the Reggio Emilia model, the Montessori approach, and Dr. Stanley Greenspan’s DIR/Floortime methodology. 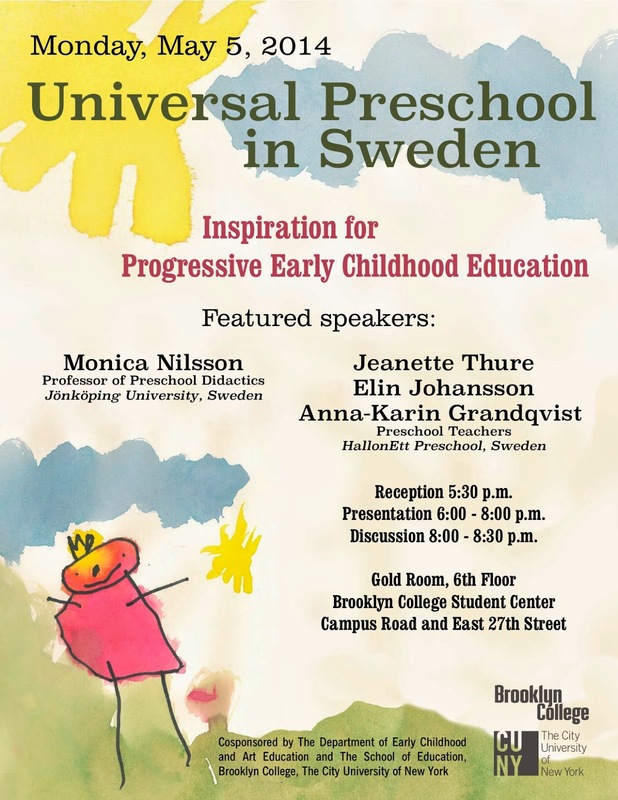 Monday night's Universal Preschool In Sweden event at Brooklyn College was a standing room only affair, with lots of wallflowers along the back wall of the room for lack of a place to sit. The focus of the evening's discussion was EDUCARE, Sweden's version of universal preschool. Educare combines the two words which are the underpinnings of the program - education and care - in order to emphasize the importance of providing a caring and nurturing environment for preschoolers to promote learning (contrast with an accountability- and results-driven approach). Educare serves students aged 1-7 years old, which was remarkable because in New York we are still trying to figure out how to scale pre-K just for 4 years olds. Sweden starts from infancy. Attendance is not compulsory but almost everyone attends. The cost to families is reasonable: while the program is not entirely funded at public expense, parents pay, on average, approximately $2,000-3,000 per child per year...but that can vary depending on income. Student-teacher ratio is approximately 5 kids per teacher, with approximately 17 children in a group. Most Educare schools are publicly funded, but there are some that are privately funded as well. Because Educare deemphasizes a rigid adherence to goals and outcomes, there are no formal goals that must be met at the end of the year. There are only informal guidelines that can be utilized to inform the curriculum. There does seem to be a national curriculum, however, and the extent to which individual schools feel compelled to follow that curriculum was not entirely clear to me. When the Swedish presenters emphasized "evaluating the quality of the preschool program," I wondered to what extent that might be at odds with the notion of "no accountability." Another point I found interesting was that Educare came about as a result of the work force expansion in Sweden in the 1970's. When more women started working, someone had to look after their children. For a while the program was run under the auspices of the social welfare system. In 1998, Educare officially became part of the educational system. Educare takes a child-centered approach, letting the child's interests and curiosities guide the teacher's instruction. Those who are familiar with the DIR Model of instructing children with autism may be familiar with this approach. Those who know of the Reggio Emilia schools in Italy may be familiar with it as well. The Swedish panelists cited Reggio Emilia as one of the inspirations behind Educare. This was the first time I had heard of Reggio Emilia. But I quickly learned that it is well-known within the education field for being a child-centered, creative approach with an emphasis on natural materials and documentation. Structuring tasks in a way that relies on the children to figure out what's necessary to complete a task (rather than simply depositing pre-determined information into the children's minds). Diversity - no discussion about how to transport the Swedish model to a more diverse demographic such as in the U.S. There was a brief discussion about "segregated areas" in Sweden where immigrant children can be educated in their native tongue. However there is an ongoing debate about whether to educate them in a segregated manner, or in an integrated manner with Swedish children to promote mastery of the Swedish language. Poverty - no discussion at all. Special needs children - not mentioned at all. Federal government's role - not clear what is the federal government's role and how Sweden establishes consistency among its various Educare schools and programs. Assessing quality of preschool program and student progress - there was some discussion about the "pedagogical documentation" that is maintained and analyzed to assess the quality of a preschool program, but it was vague. Overall an interesting event that got the wheels in my mind turning! This weekend I had the pleasure of attending the annual Council of Parent Attorneys and Advocates (COPAA) conference in Baltimore, Maryland, a short and immensely enjoyable 3-hour Amtrak train ride from NY Penn Station. This year's conference boasted the largest attendance ever, attracting approximately 550 attendees from all over the country. This was my 5th COPAA conference. As I contemplated this while roaming the corridors of the Waterfront Marriott where the conference was held, moving from one session to the next, this felt like a significant milestone for me. As usual, the conference gave me an opportunity to reflect on where I’ve been over the last year. It was also nice to look around and recognize a significant number of the attendees. Cross Examination of Experts - Great full-day workshop with Frank Hickman and Tracey Walsh focusing on the art of cross examination. Legal and Academic Perspectives on America's Public Education - Big-picture, policy-related session considering the roots of education from the 1600’s through the present, new movements including online education and school choice, and the usual hot-button issues of accountability, high-stakes testing, evaluations, and teacher performance. The afternoon portion of the day (a bit harder to get through perhaps due to sleep deprivation kicking in) addressed the intricacies of the Common Core and Universal Design for Learning, and their implications for special needs students. Keynote Speaker LeDerick Horne - This year's speaker, LeDerrick Horne, truly delivered. He spoke about the difficulties he experienced as a child with a learning disability and the constant fear of public embarrassment that he endured on a daily basis. When he was close to breaking down, he chose instead to break through. He pushed through elementary and high school, attended college, and obtained his undergraduate degree. He has become an entrepreneur and performance poet who has worked as an advocate on the national, state and local level. While he continues to struggle with his learning difficulties, he has devised useful tools to help him cope. His presentation also included a poem or two. More information available at www.lederick.com. General Session - Matthew Cohen delivered an impassioned speech, acknowledging the gains we have made in the areas of disability and civil rights law, but emphasizing the big steps we still need to take to move forward. He spoke forcefully, peppering the audience with real-life examples of injustices he has seen in cases he has handled, and the energy in the room rose quickly. That led to a group discussion with the audience, which led to several people speaking about the importance of embracing the concept of individuals with different abilities and focusing what unique skills people have rather than focusing on what they lack, which resonated with me and reminded me of my visit to the Ann Sullivan Center. 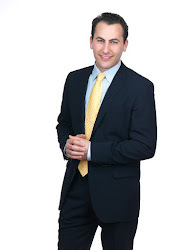 Life Planning for Families of Loved Ones with Special Needs - An emphasis on special needs trusts and guardianships, and how those issues can be tied into due process hearings and/or settlement agreements. Creating a Winning Stay Put Argument - An interesting session that highlighted some of the many permutations that one might encounter when dealing with the issue of "stay put" and the question of what should be considered a child's last agreed upon placement. Retrospective Testimony/Monday Morning Quarterbacking - Unfortunately I did not attend this event, but after hearing everyone talk about it, I wished I had. The session focused on the issue of retrospective testimony, and the implications of recent court decisions regarding this issue. A Case Study: An Effort To Grow Special Education Advocacy Awareness - Andy Cuddy presented on his recent media campaign to reach impoverished special needs parents in Rochester through the use of television commercial spots. The campaign emphasized raising awareness in a tactful way. While some may have dismissed the event off-hand, I was glad I attended. I found the presentation to be professional, informative, and thought provoking. Redefining Functional Skills for the 21st Century - This workshop helped me to reconsider what it means for a child with special needs to be "functional" in the 21st century, with a focus on inclusion in a general education setting. Latest Top 40 Chart-Topping Decisions - The most entertaining case law review that I have ever attended (and it's no easy task to make this stuff exciting). The presenters delivered their top 40 cases over the last several years in the format of a top 40 music countdown, highlighting fact scenarios that were particularly ridiculous and excerpts from decisions containing language that was particularly powerful. COPAA is a great organization to join if you think you might benefit from a network of attorneys, advocates, parents, and others involved in the area of special needs. Parent membership costs $50 per year and provides access to a wonderful community. For more information, you can visit the COPAA website: http://www.copaa.org/. Next year's conference is scheduled for March 5-8, 2015 at Paradise Point Resort & Spa in San Diego, California! This past Friday I had the pleasure of visiting The Center For Discovery, a New York State-approved private school for children with various kinds of developmental disabilities. I had been vaguely familiar with the program for some time but I became deeply interested in learning more about it after speaking with a colleague who had said that they were doing similar things as the Ann Sullivan Center was doing in Peru (see http://blog.dayanlawfirm.com/2013/12/reflections-on-peru.html). So I contacted the school and set up a visit. You may remember that Friday was the day of the fog. For much of the close to two-hour-drive up to Monticello, I was looking out at a wall of whiteness. I was surrounded by snowy mountains, snow on the ground, and an intense, consuming fog that all seemed to blend into one. The road was quiet. The visibility on the road was awful. Many times the road disappeared, and I changed lanes to get behind a car that I could follow closely because I figured as long as I could see the car that meant there was still road. Once I got over the initial shock of the daunting driving conditions, I began to appreciate the stark beauty. The bright white and bare trees created a somewhat eerie but incredibly peaceful landscape which I said I would describe as "fantastical" if others asked. I felt myself breathing in the beauty of my surroundings by inhaling them through the air vents on the dashboard. My senses felt heightened and I kept myself from turning on the radio because I didn't want to ruin the moment. Though my day had only barely started, I was feeling very glad to be making this trip. I arrived at The Center For Discovery around 10 a.m. The school grounds cover 1,500 acres of land with various campuses, which are set up thoughtfully to meet the unique needs of the students housed at each campus. For example, a campus intended for children with autism, was expertly designed by none other than Temple Grandin whose goal was to construct the campus in way that was sensitive to the sensory needs of its students, as children with autism can become easily overwhelmed by light, sound, and smell. I also saw a kitchen that was tailor-made for individuals in wheelchairs such that all of the kitchen equipment could be adjusted higher or lower according to the student's height. The school primarily serves individuals aged 5-21, who, under the Individuals with Disabilities Education Act, may be entitled to funding for the cost of the program. The Center also serves individuals above the age of 21, but as a general rule those individuals would need to obtain funding through Medicaid and the Office of People With Developmental Disabilities (OPWDD). The oldest individual currently enrolled is 85 years old. The Center began in the 1940's as an institution for the education of individuals with cerebral palsy, but gradually evolved to include students with a range of issues including autism and multiple physical handicaps. The Center For Discovery, like the Ann Sullivan Center, emphasizes functional education, rather than rote learning of academics that may have limited practical application in the real world. Students learn hands-on by participating in a panoply of activities including gardening, cooking, dancing, farming, and working in the Center's on-site restaurants and cafes that are designed to teach important skills. During these activities, student receive ongoing support from school staff which focuses on teaching important skills necessary to function in the real world and aims to prepare students for an eventual transition to a less supportive educational setting or, where possible, an appropriate work environment tailored to the specific interests and abilities of the particular student. The Center is primarily a full-time residential program, which means that the students live on campus 24 hours a day, 365 days a year, with some exceptions for family visits and vacations. To a lesser degree, the Center functions as a day program for students who are bussed from nearby districts. There are currently about 500 total students in the two programs. There are about 1,500 staff members including teachers, psychologists, social workers, related service providers, behavior specialists, and "integration specialists." Classrooms typically consist of 6 students and approximately 3 staff members. Students are grouped according to their needs and abilities. Reverse inclusion provides mainstreaming opportunities for students to interact with typically developing peers from the community through sporting activities and other opportunities to socialize and mingle. The Center For Discovery has a research arm in addition to the hands-on instructional program described above. Partnering with different institutions around the country, the Center is actively pursuing answers to questions concerning effective approaches to the education and development of individuals with disabilities. The Center is active internationally by participating in conferences around the world concerning various special education topics. The Center also conducts assessments and evaluations to help families better understand what supports and interventions are necessary for their children to make meaningful gains. The Center also works closely with local school districts through staff trainings and workshops, which has allowed the Center to extend its reach to help students outside of its own program. The Center is working on plans for expansion in order to make its services available to a wider population. I would like to thank the wonderful people at The Center For Discovery who welcomed me warmly and spent over three hours showing me around, discussing their amazing program, and sharing a glimpse of some of the very exciting things that they have planned for the near future. Thank you for the fantastic work that you do, and good luck with your new endeavors!